We Remove Asbestos. We Provide Skips. We Reclaim. We Recycle. Comley Group are celebrating their Sixtieth year of trading in 2019, with the Company being Established in 1959 by Cyril George Comley. 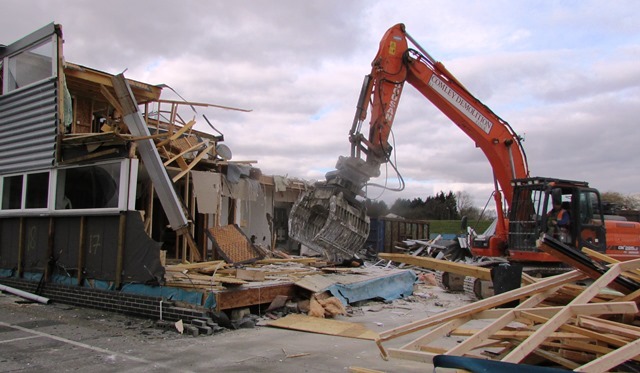 Following on from opening a Waste Transfer Station, following the Incorporation of the Company as a Limited Company and the appointment of Cyril George Comley's son, Richard Comley, as Managing Director the Company became more focused on Demolition, joining the National Federation of Demolition Contractors (NFDC) in 1992. 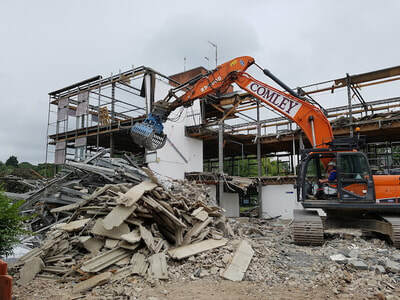 As the year progressed the Company expanded, establishing Comley Reclaim and Licensed Asbestos Contractors Jeto Limited and, more recently, Comley Skips. 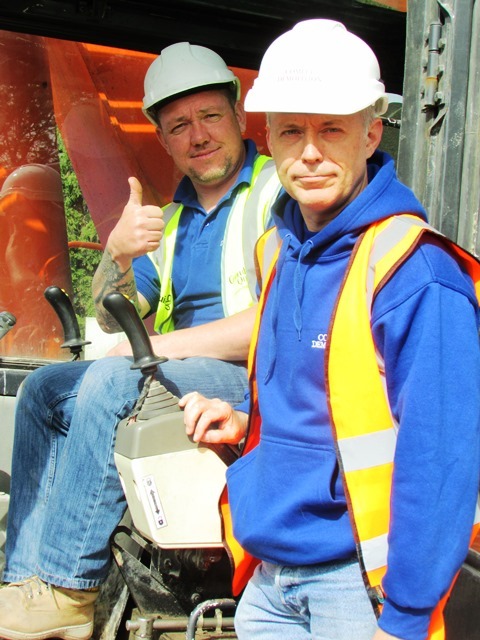 Today Richard's son, Toby Comley, is Managing Director, continuing to move the Company forward, investing not only in Plant & Machinery, but also in it's staff, ensuring that the Company operates safely & environmentally friendly. 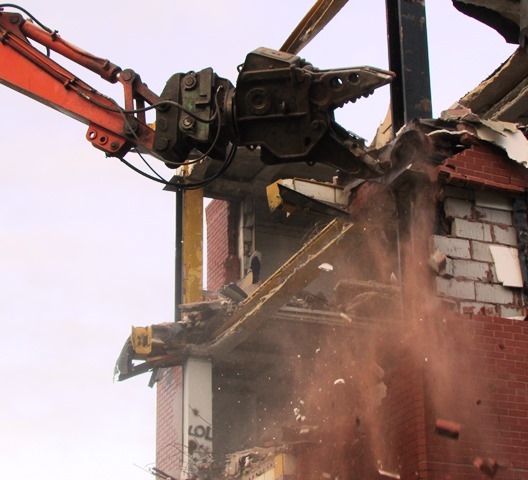 ISO 9001:2015 Quality Management for Provision of Demolition and Deconstruction of structures across Southern England. Held since 2013. ISO 14001:2015 Environmental Management for Provision of Demolition, Waste Transfer and Reclamation across Southern England. Held since 2016. 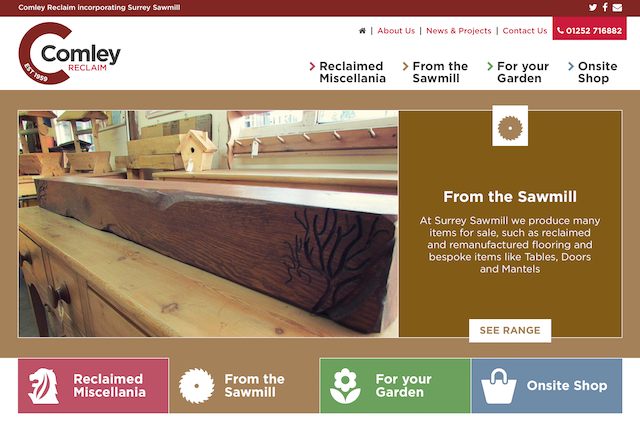 ​They require an enthusiastic sales member and an ambitious team player to join the production team in the sawmill workshop. ​Take at look at the Comley Reclaim website to find out more about what they produce and sell. 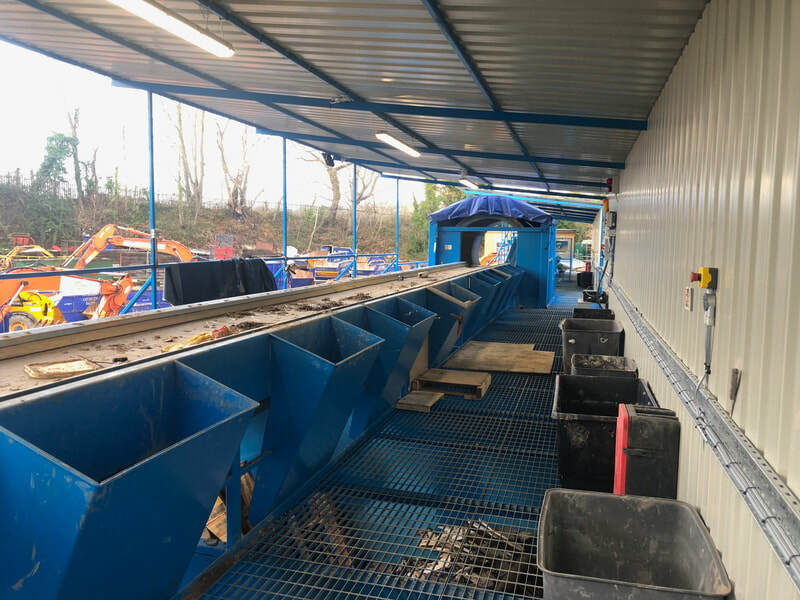 Just before Christmas 2018 we invested in a new picking station at our waste transfer facility based at Calf Lane Quarry. 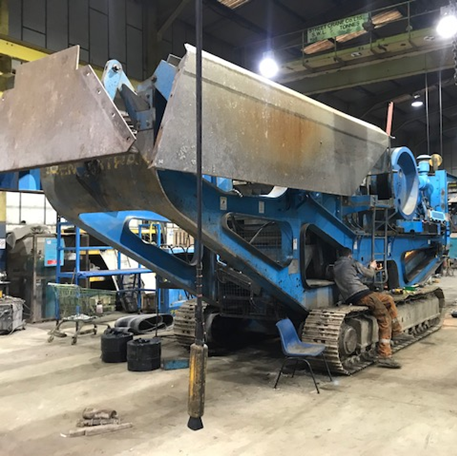 The Installation of this new plant allows us to sort the arisings generated from our demolition activities and skip hires more efficiently and segregate the arisings into cleaner recyclable streams. The sorted arisings can then be sent for recycling, therefore avoiding landfill, helping towards fulfilling the Government strategy to reduce reliance on landfills. ​ The lead article featuring the investment made in Plant, Equipment and Personnel this year. ​ Minutes from the Annual Staff Meeting. Materials Handling World Magazine has a feature regarding Comley's recent purchase of Renault C440 Trucks. 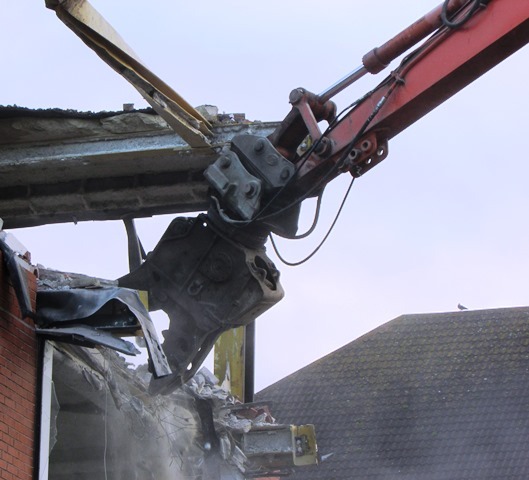 The National Federation of Demolition Contractors (NFDC) Audit Scheme is to assist NFDC members to demonstrate that they are able to properly discharge their legal health & safety duties, ensuring clients are aware that by using NFDC members they can be assured it is in their best interests. 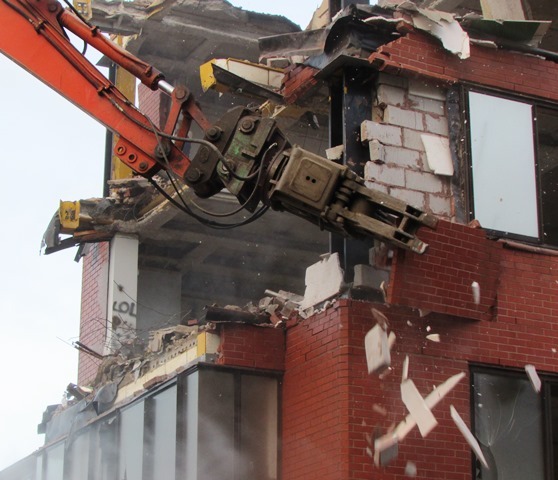 Once again Comley Demolition, a member of the NFDC since 1992, has met the mandatory criteria, meeting or exceeding health & safety requirements both at head office and on site. We are pleased to confirm that Comley Demolition has achieved the internationally recognised accreditation ISO 9001:2015 for Quality Assurance. This marks the sixth consecutive year that Comley have met the standards required for this certification. 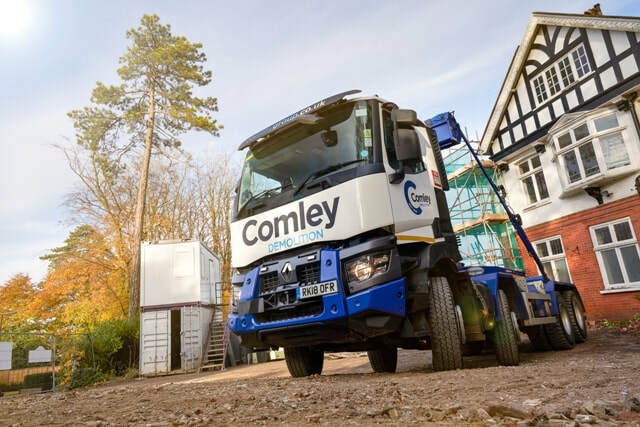 You can be assured that the Comley Group will ensure that the service received from us will be of the highest quality at all times, from your dealings with the office through to the service on site. ​ The lead article featuring Melanie Hunt, our new accountant. ​ The arrival of new Renault HGV's. Welcoming back work colleagues, Stuart & Billy, that have previously left but now returned. 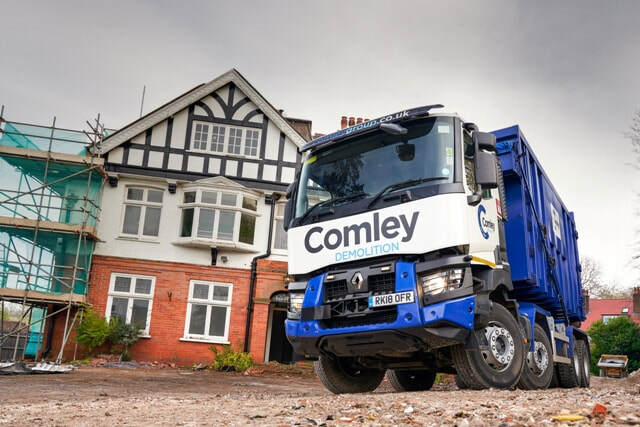 Comley Demolition have taken delivery of two new Renault Heavy Goods Vehicles to replace older vehicles in the fleet. 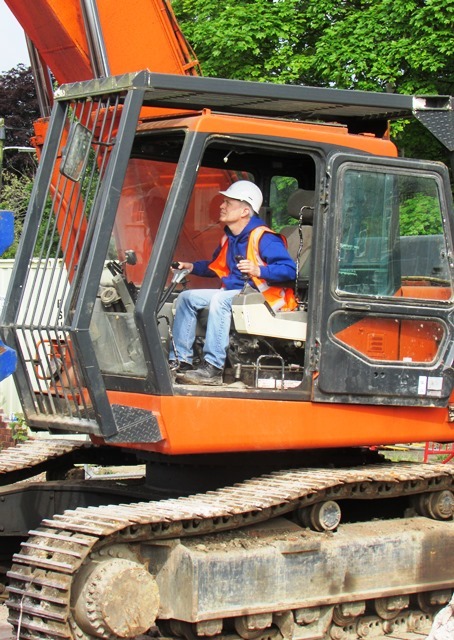 Fitted with the very latest technology they provide reliable transport to and from site. 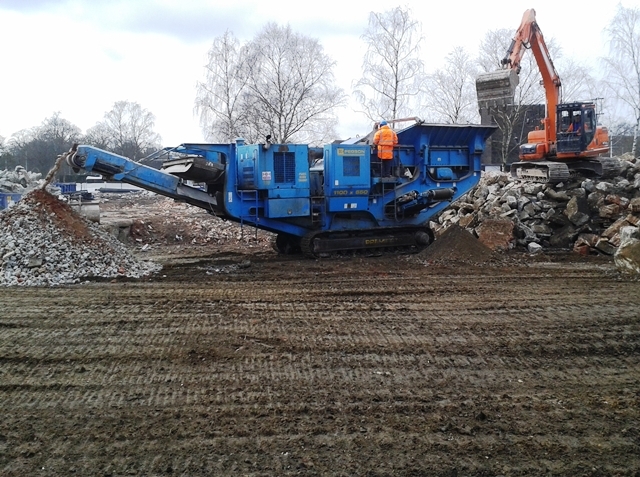 After a couple of months work our Premier Track crusher is back and looking like new. It's been stripped down and refurbished and rebuild and is once again ready to crush arisings on site, ensuring that our recycling rates remain excellent and reducing the carbon footprint of carting arisings away from site. ​As of the 25th May the General Data Protection Regulations come into force. Our Privacy Notice is published under the 'Comley Group' tab. 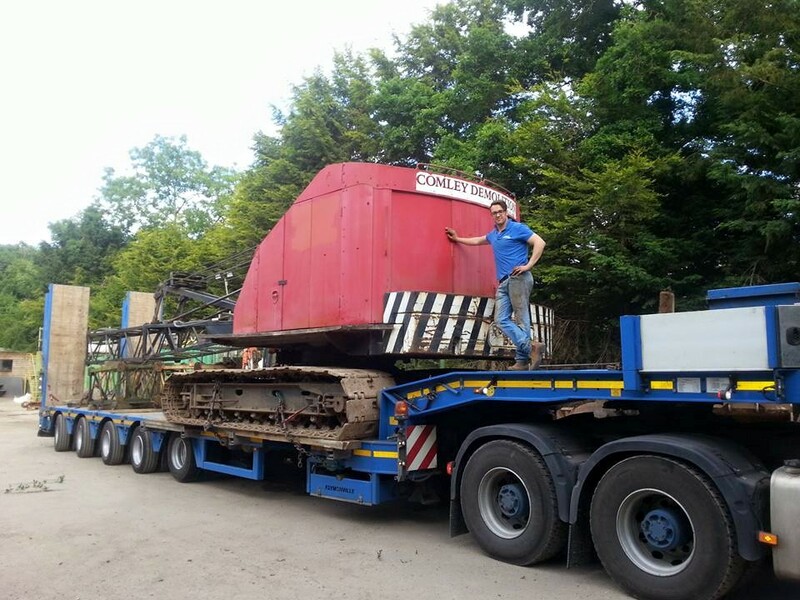 ​ The lead article detailing old kit being shipped out to a goldmine in Africa, and new drivers joining the company. ​ A Comley Group Safety Toolbox Talk on Hand/Arm Vibration. ​ The Group being featured in the Public Eye and Press. Comley Chickens are in the Yard! 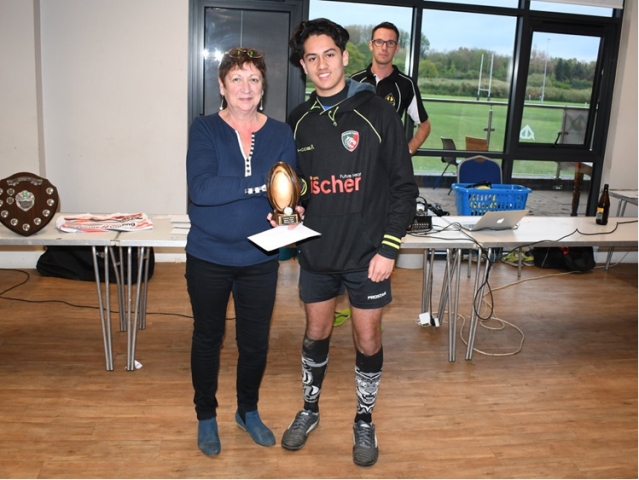 ​Farnham RUFC Rugby 7's Comley Skips mixed touch competition - the winners! Congratulations to the Winners, pictured here with Julia Comley presenting the prizes on behalf of Comley Skips. 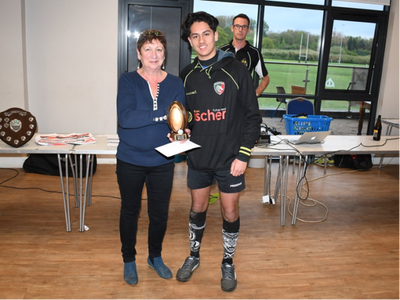 ​The Farnham Gazelles won the contest with Perins Alumni Touch being the worthy runners-up. Comley Skips is sponsoring 'The Comley Skips Touch Competition' which is taking place this Saturday, 28th April, at Farnham Rugby Club. Julia Comley, herself, will be presenting the winning team with the prize on the day! 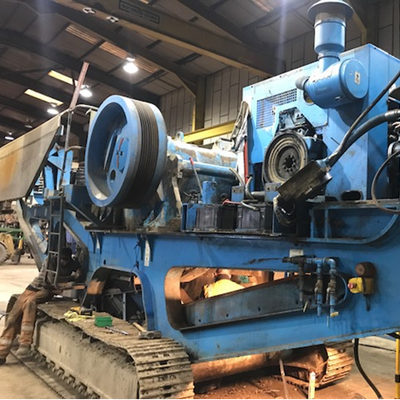 Comley Demolition is having it's Terex BL-Pegson Premiertrak 1100x650 Crusher fully refurbished and rebuild, ready for many more years of service out on site, helping to eliminate waste from demolition by producing quality aggregate ready for use on site. 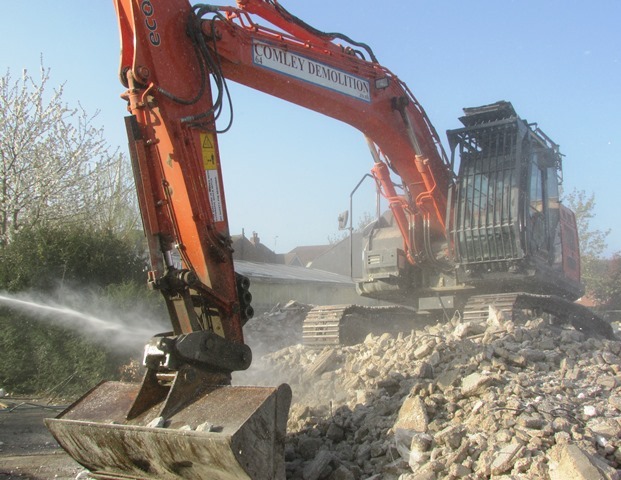 Comley Demolition, Comley Skips and Comley Reclaim have not only been reaccredited for ISO 14001 but also met the requirements of the updated 2015 standard and therefore been issued with their ISO 14001:2015 certification. 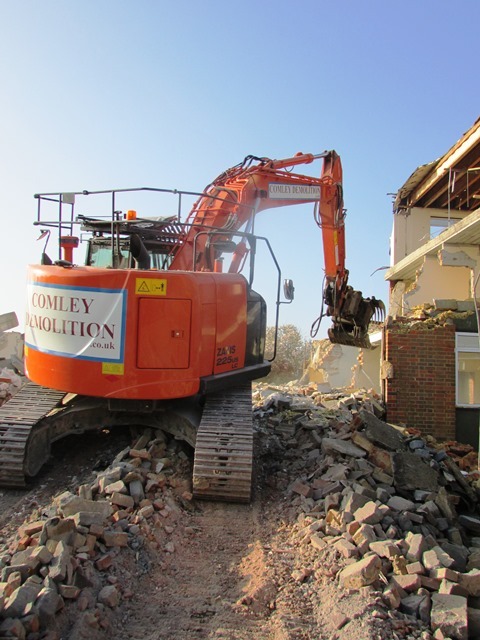 ​The Comley Group offers the complete one-stop service for environmentally friendly and sustainable demolition projects. 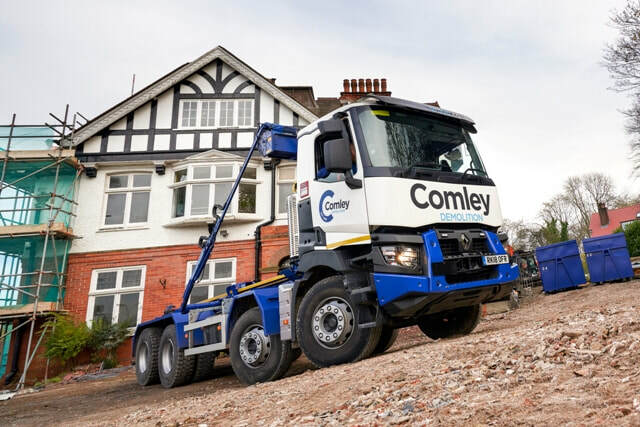 The Comley Group has been assessed and has met the registered level requirements of the Fleet Operator Scheme. 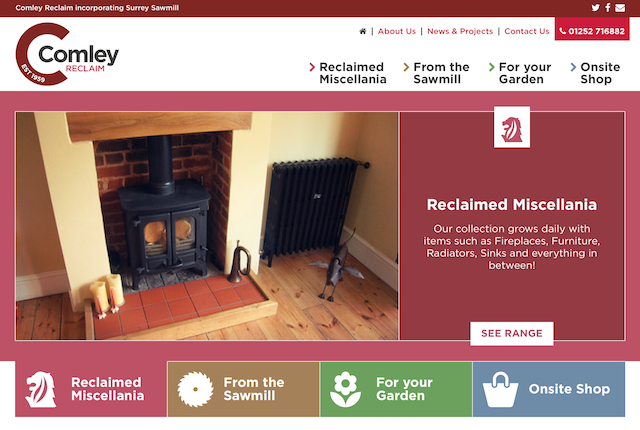 Following a few months of development we are pleased to announce that Comley Reclaim's new website is now available to visit. Comley Group is proud of it's recycling credentials, providing a full reuse & recycling alternative to disposal where we can, taking a major role in this is our reclamation yard at Comley Reclaim where, not only do we reclaim items from demolition projects, we also operate a Sawmill where we can manufacture flooring, fencing and furniture to customers specifications. 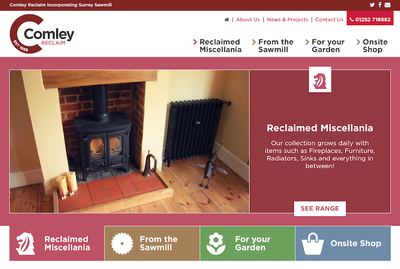 Head over to www.comleyreclaim.co.uk for more information. This week marks a hundred years since women, albeit only some, were given the vote in the United Kingdom. Mark Anthony, of Demolition News, makes reference to this and the role of women in the demolition industry, giving reference to our own Julia Comley, who has been involved in the industry for over 38 years. ​At the annual Comley Group festive party, Julia Comley presented long-term sub-contractor Alan Keet with The Richard Comley Award, in recognition for his outstanding contribution to the company in the previous year. Congratulations and well done to Alan. 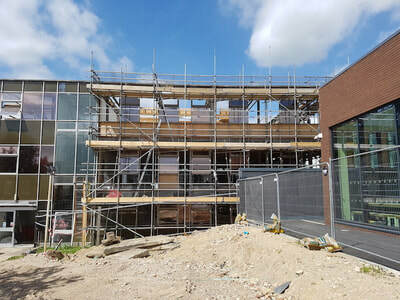 ​Completed successfully for our client Neilcott Construction, we facilitated scaffolding and undertook asbestos removal, both licensed (with Jeto Limited) and non-licensed before demolishing the structures, all without incident and on-line and within budget. 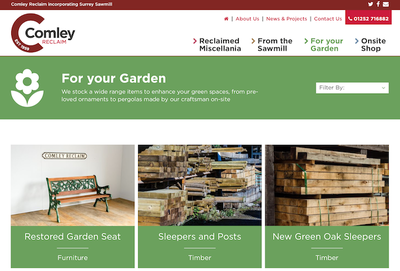 The Comley Group Spring newsletter is now available, full of essential information and exciting news such as our recent awards success, Twickenham triumph, trips to Buckingham Palace, new plant and helicopter rides! ​Pick up your copy from the Comley Group head office to find out more! 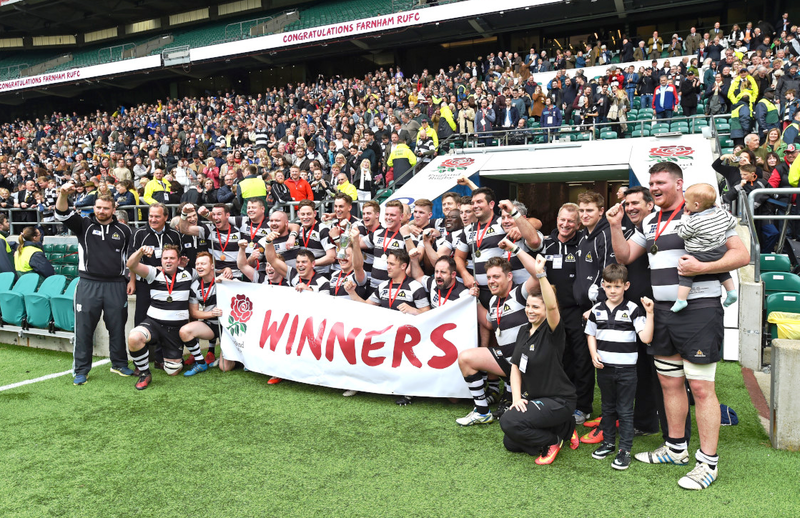 Farnham RUFC triumph at Twickenham! ​The Comley Group would like to congratulate the ​Farnham RUFC 1st XV on their 37-15 victory over Droitwich at Twickenham this weekend, crowning them Senior Vase Trophy winners for 2017. The Comley Group have been proud sponsors of Farnham RUFC for a number of years, and several member of staff from the group's offices made the journey to Twickers to see the home team triumph and enjoy what was a fantastic day out. The success is made all the better as the Comley Group Managing Director, Toby Comley was a key part of the team's victory and was able to enjoy this once in a lifetime opportunity to play on the hallowed turf. Well done to Toby and the rest of the Farnham 1st XV! Comley Group bags industry award! 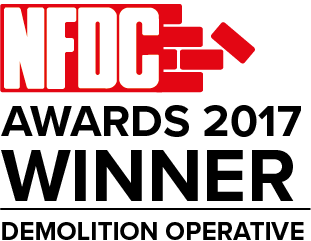 The Comley Group are proud to announce that one of the group's demolition operatives was selected as the 2017 Demolition Operative of the Year at the National Federation of Demolition Contractors (NFDC) annual Awards Luncheon on 31st March in London. 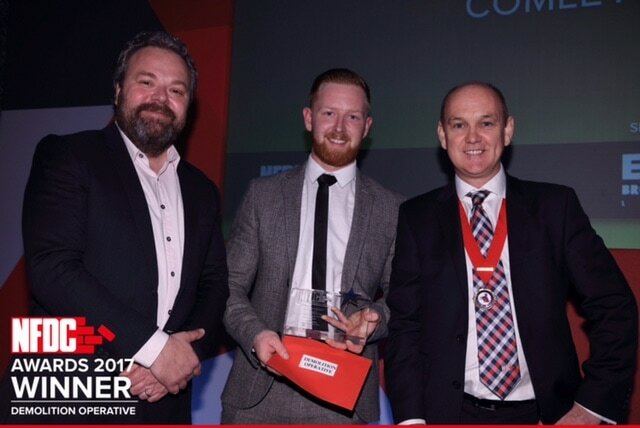 Demolition Operative, Billy Rogers, was picked as winner from a hard fought group and presented with his award by comedian Hal Cruttenden and NFDC Vice President, Martin O'Donell. 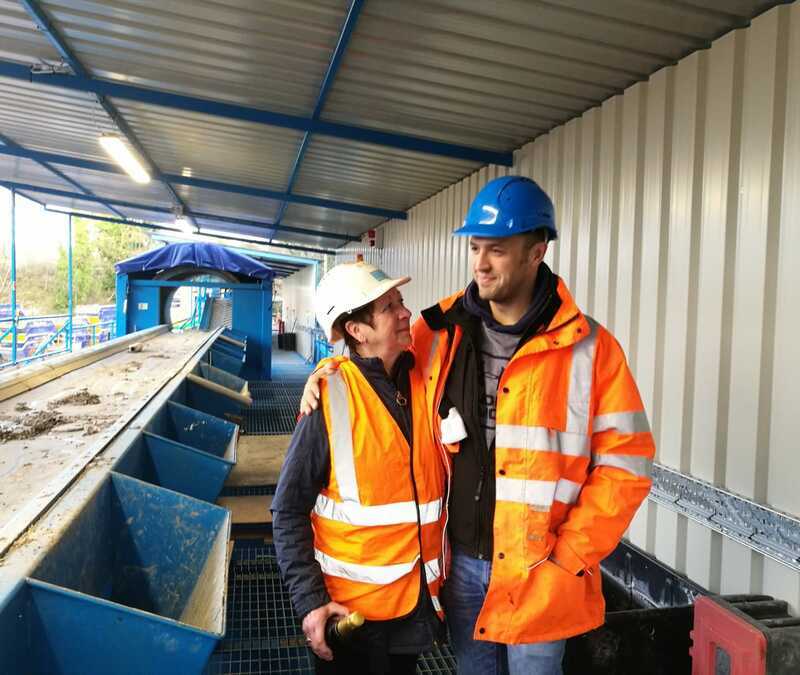 Billy Rogers joined the Comley Group in October 2012, aged 19, as an operative at our licensed waste transfer station, Calf Lane Quarry, and after proving his ambition and capabilities, moved over to Comley Demolition in 2014 where he has excelled. L - R: Comedian Hal Cruttenden, award winner Billy Rogers and NFDC Vice President, Martin O'Donell. The Comley Group joined forces with their client, Brymor Construction in order to present local charity, the Jigsaw Trust, with a cheque for £1,000 to help provide the charity’s café social enterprise with more equipment. The Jigsaw Trust, based on Dunsfold Park near Cranleigh, supports children and young adults with autism. The charity operates Jigsaw School for children aged 4-19 and Jigsaw+ for adults aged 18+. Café On The Park was set up as a work experience setting for the pupils and clients to learn new skills within a vocational environment. It is staffed by catering professionals with selected tasks being undertaken by Jigsaw pupils and clients. 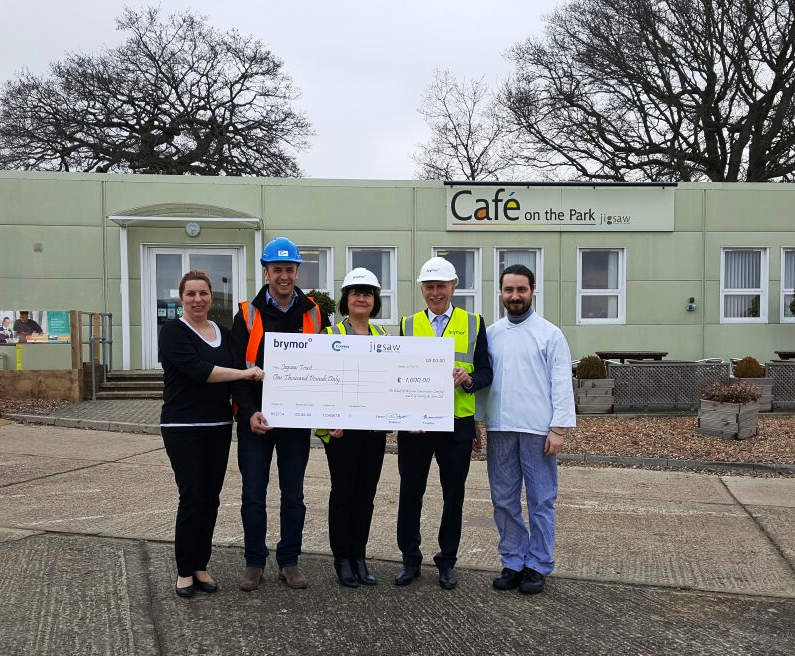 The Comley Group and Brymor Construction have both been working on the site at Dunsfold Park and staff from both companies have become frequent visitors to the cafe. Toby presented the cheque along with the Chairman of the Brymor Group, Steve Morton. L-R: Mariana Nedulcu (Catering Manager), Toby Comley (Comley Group), Kate Grant (CEO, Jigsaw Trust), Steve Morton (Brymor Group) and Victor Amarandei (Cook). Memorial bell rings out at the Comley Group. This week the Comley Group unveiled a lasting memorial to former MD and founder, Richard Comley, who passed away in June 2013. 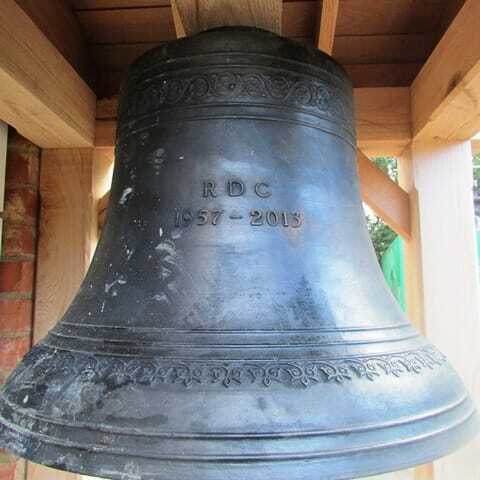 The one tonne bell, manufactured by renowned Whitechapel Bell Foundry and engraved with Richard's initals and dates, was erected at the Comley Group HQ in Odiham, Hampshire and was rung for the first time by company owner and Richard's widow, Julia Comley. As Julia remarked, the bell has special significance to the company: "In 2001, Richard recovered the large Whitecahpel bell from the Catholic Church of St Michael and All Angels, Dunsbury Way, Leigh Park, Havant after being awarded the contract to demolish following an arson attack. "The bell has sat in the Yard by the office for the past 15 years and Richard made sure the bell was rung to celebrate each time we were successful in being awarded a contract! 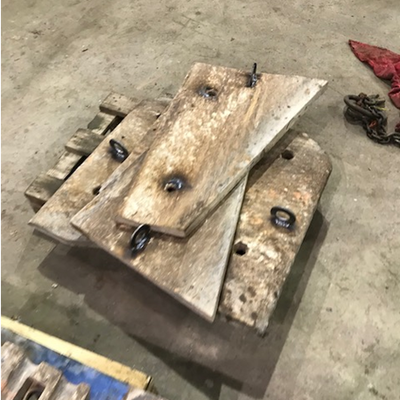 "Unfortunately this year the bell was damaged and the decision was made for the original to be melted down and recast by Whitechapel Bells, retuned to the same pitch as the original bell and have Richard’s initials and dates inscribed as a memorial. "This means that both the company and Richard will be in the records at Whitechapel, who will hold these new details in perpetuity." An entry in the Guinness Book of Records lists the Whitechapel Bell Foundry as Britain's oldest manufacturing company, having been established in 1570 (during the reign of Queen Elizabeth I) and being in continuous business since that date. The bell has been erected outside the HQ office in a frame made by the talented team at Comley Reclaim. 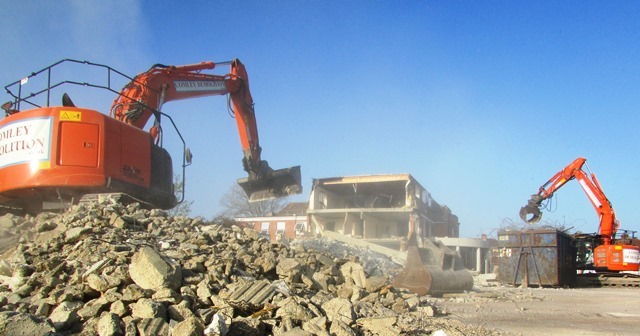 Comley Demolition have successfully completed demolition of several large industrial units in Southampton. 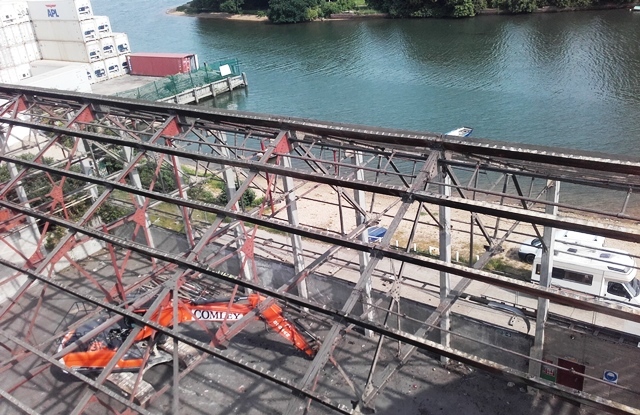 Over 8,000m2 of asbestos cement roof sheeting was removed from the site by our asbestos removal specialists, Jeto Limited, and all other materials were removed from site. Another excellent example of the different branches of the Comley Group working together on the same project. Exciting rebranding for the Comley Group! 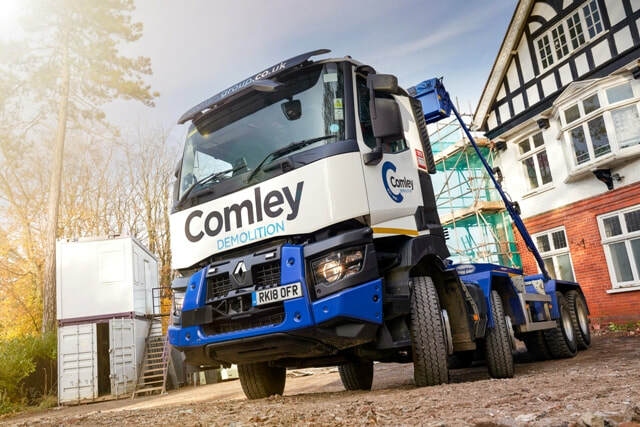 The Comley Group are celebrating over 50 years in the demolition industry with the launch of their exciting new branding. The new logo’s bring together the four main departments of the Comley Group, Demolition Engineers, Asbestos Specialists, Skip Hire and Reclamation, under a new fresh and modern image. The logo acknowledges the heritage of the family run company while providing a new platform from which to promote the group onwards and upwards. Keep an eye out for our newly rebranded machines, vehicles and skips which will be on the roads over the coming months, and for our teams in their freshly rebranded kit on site! 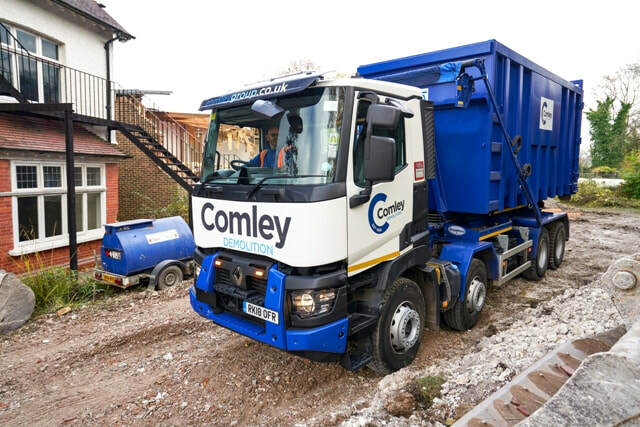 The Comley Group has achieved the internationally recognised ISO 14001 standard across the entire groups business – Comley Demolition, Calf Lane Quarry Waste Transfer Station and Comley Reclaim, establishing it as one of the leaders in its field. This independent assessment was conducted by the leading Certification Body, the British Assessment Bureau and demonstrates the Comley Groups commitment to customer service and quality in delivery. 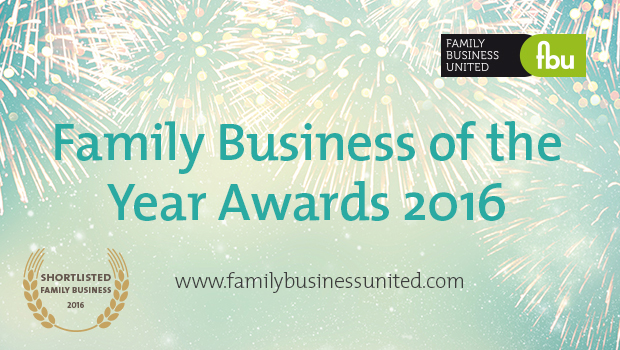 Comley Group nominated for Family Business of the Year Award! We are pleased to announce that the Comley Group has been shortlisted in the London & South East category of the Family Business of the Year Awards 2016! The Family Business of the Year Awards are organised by Family Business United, the award-winning magazine and resource centre the champions and celebrates the family business sector. Now in their fourth year, these awards recognise the diversity, strength and depth of family firms across the UK and seek to highlight the contribution that family firms make to the UK economy. To vote for the Comley Group, simply click on the link below and vote for C G Comley & Sons Limited. Thank you for your support! 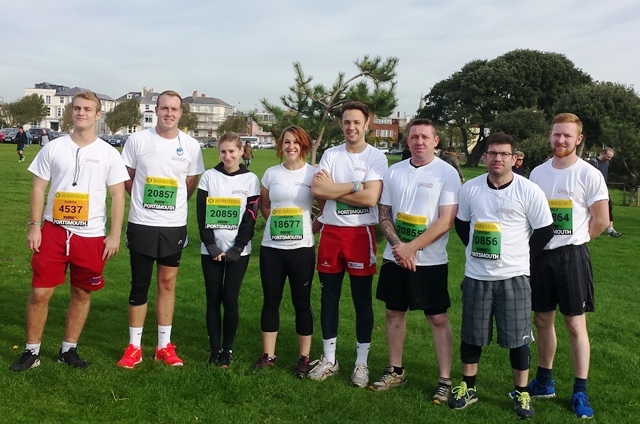 Great South Run success for the Comley Group! Unseasonal sunshine and a complete lack of wind greeted runners to Southsea on 25th October for the Great South Run, a 10 mile event taking runners around the historic streets and seafront of Portsmouth. After months of training, the team from the Comley Group lined up at the start with over 20,000 fellow runners and charity fundraisers to tackle the challenge, with some fantastic results, all of the team completing the course in under 2 hours. The group were able to raise over £1,000 in sponsorship for BRIGHT Cancer Research, in memory of our much missed late MD, Richard Comley. 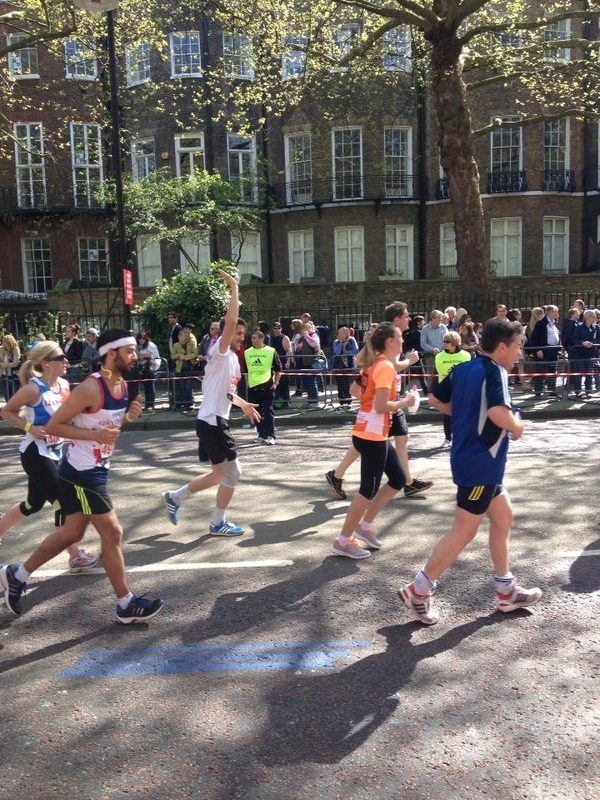 L-R Curtis Green (also running in memory of Richard), Carl, Kamila, Jen, Toby, Michael, Clifford and Billy. 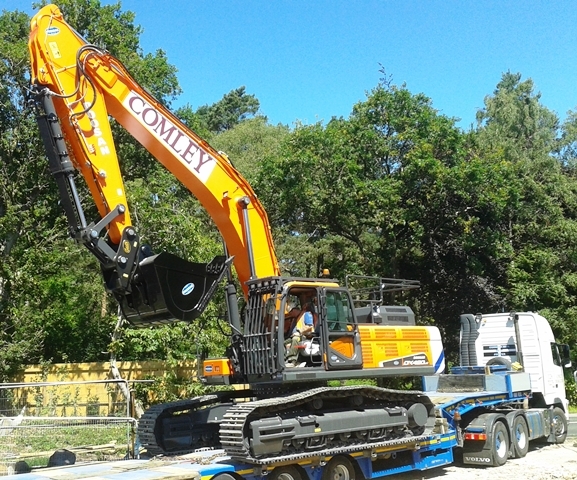 The Comley Group saw a more unusual visitor to their site in Bordon this month. 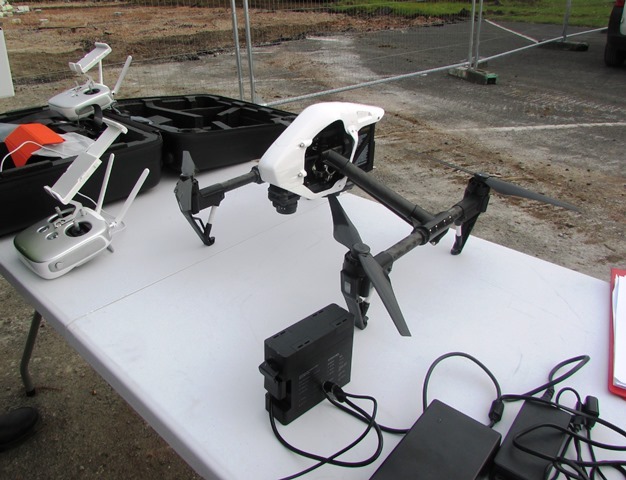 A team from Demolition Drones made a visit to record both footage and stills of the demolition of the former Quebec Barracks in the town in order to make way for new eco-housing. Keep an eye on the Comley Group website and social media, as we will be posting footage as soon as it is out of editing. Watch this space! Comley Group to demolish the Great South Run! A team of runners from the Comley Group are taking on the challenge of the 10 mile Great South Run this October, in memory of the late MD, Richard Comley. Michael Wells, Clifford Pitman, Billy Rogers, Mark Watkins, Carl Warner, Kamila Dziedzic, Jen Atkinson and Richard's son and current MD, Toby Comley will all be pounding the pavements of Portsmouth on 25th October. 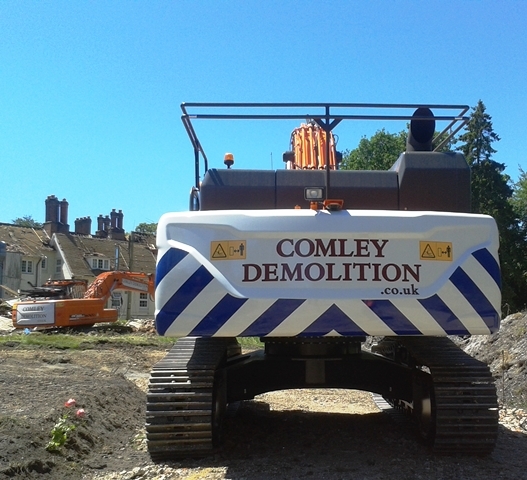 The team all work for the Comley Group, either as sub-contractors or as part of the crew from Comley Demolition, Comley Reclaim and Jeto Limited. They are raising money for BRIGHT Cancer Research, a charity that raises funds for vital research and new treatment options for gastro-intestinal cancer patients. Richard Comley was diagnosed with stomach cancer in 2012, and he continued to work every day through numerous chemotherapy treatments, always with a smile and his trademark stoicism. He never let the disease affect his work or the important friendships he had developed with many of his colleagues. He passed away in June 2013 at the age of 56, and remians an inspiration to both his family and many of his former colleagues. Many of the team are taking on this challenge for the first time, and with plenty of training and hard work, it will be a huge achievement for all of them when they cross that finish line after 10 miles! Keep an eye out on Channel 5 on 25th October for the Comley Group runners in the televised Great South Run! 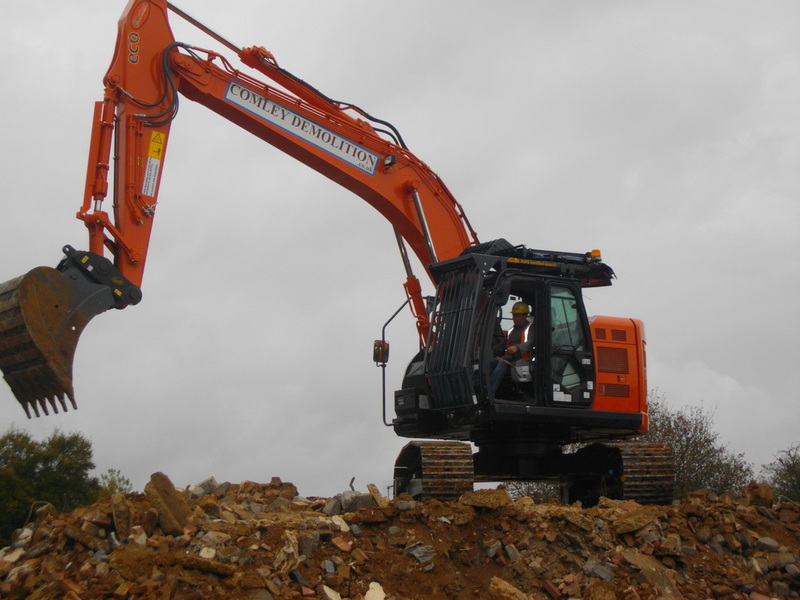 This month has seen the Comley Group add two brand new machines to the fleet, a monster Doosan DX 420LC-5 and a Doosan 255 from Berkshire based Promac Solutions Limited. 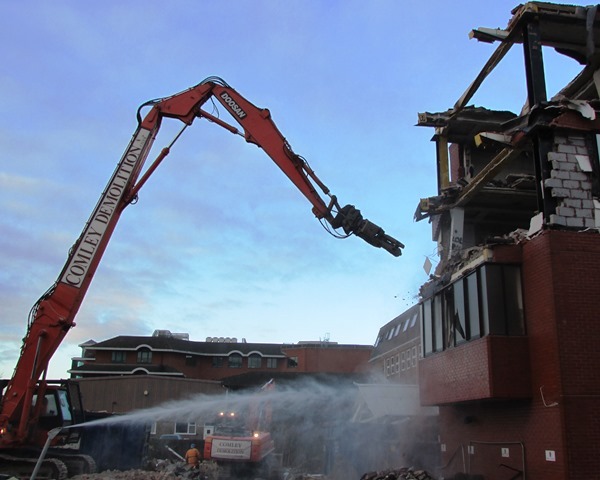 Managing director, Toby Comley said: "The acquisition of these two machines, equipped with demolition attachments, allows us to execute complex demolition projects for our clients. 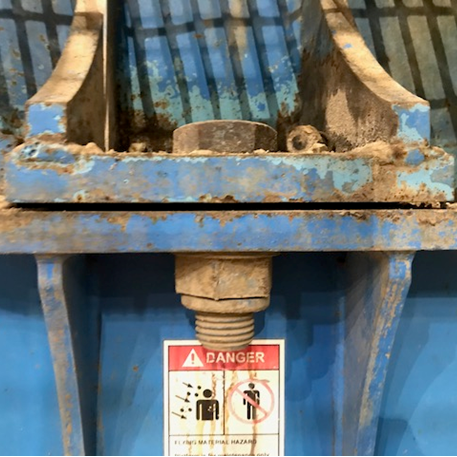 "The purchase of these two new machines has allowed the growing group to meet the demands of our increasing customer base, meeting targets and achieving programmes. 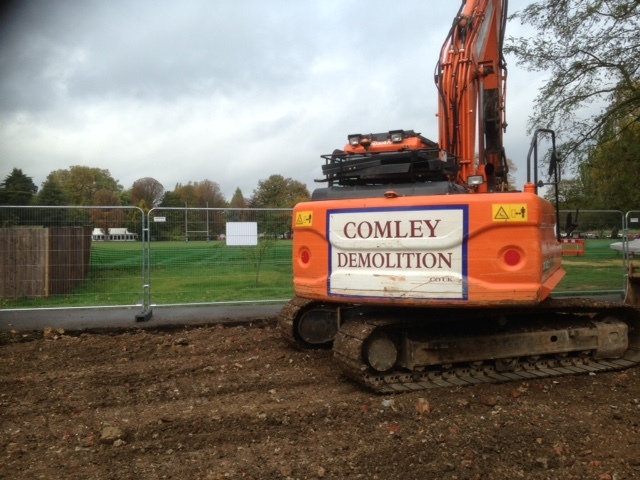 The Comley Group's 22RB crawler crane is making a special appearance at the NFDC Demolition Expo in Reading. Click the link below for more information. 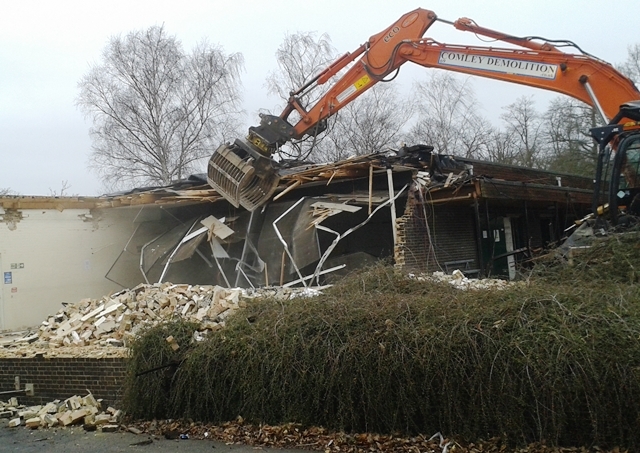 Demolition of the former Alfred Sutton Boys Comprehensive School began this month with former pupil, David Armstrong, taking a bite out of his old school. The school’s gym and surrounding buildings, which closed in 1986, acted in more recent times as Reading Activity Centre and part of the TVU, and are being demolished by Hampshire based Comley Demolition, the company where David is now Operations Manager and director. 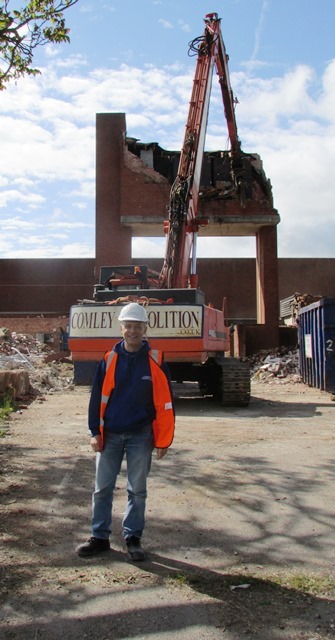 After attending the school from 1981 to 1985, David was able to live out the dreams of many a school child and bring his former sports hall to the ground with the help of Comley Demolition’s 22 metre tall and 55 tonne monster High Reach machine, under the careful supervision of Demolition Manager, Michael Wells. 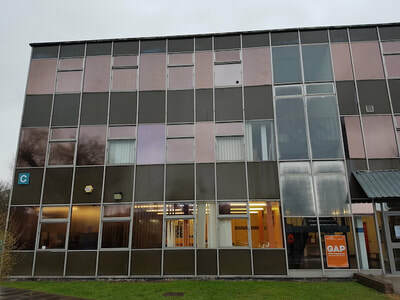 David said: “It brought back a lot of memories when looking round the remaining corridors and the sports hall of my old school, where we played games such as the notorious ‘Murder Ball’. 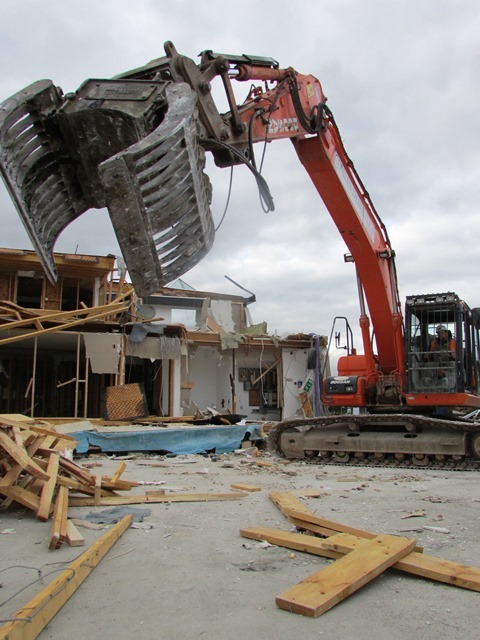 “My job now has allowed me to work closely with the teams both demolishing this site, and the contractors who will be developing it in the future. 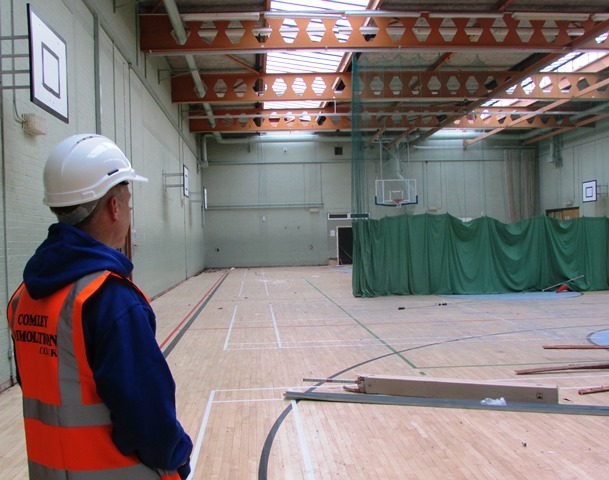 ​"It was sad to see it go, but a fantastic experience to get behind the controls of our High Reach and tear in to my old sports hall!" 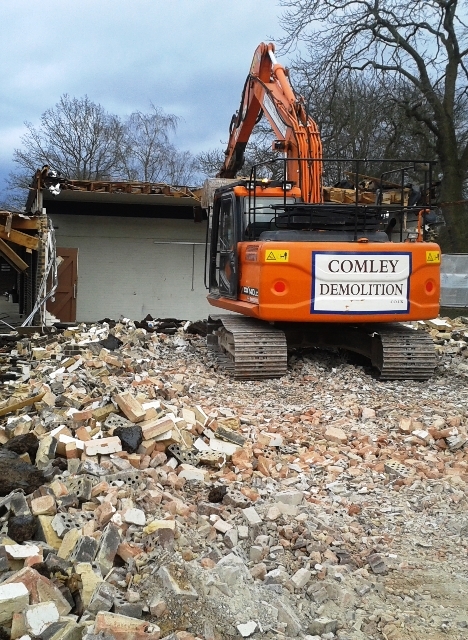 The Comley Demolition team have completed a challenging site at the former council offices in Romsey. Comley's High Reach tackles a city centre project in Woking. 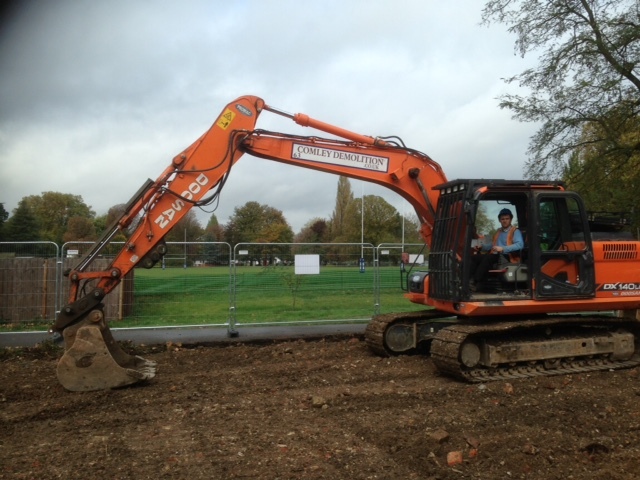 Sensitive site proves no problem for Comley's team. 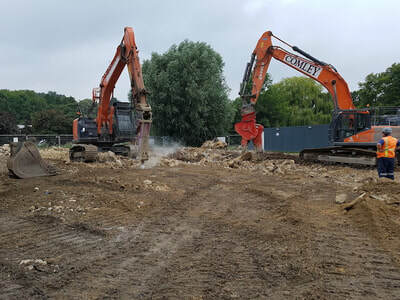 The Comley Demolition team faced down another challenge this month with the successful completion of a demolition project at a sensitive site in Farnborough. 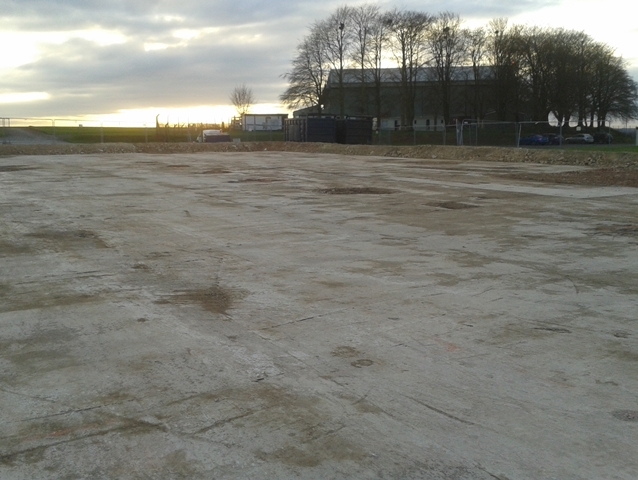 Recently completed demolition work carried out by the Comley Demolition team at the historic Netheravon Airfield was completed ahead of time and to the client’s high standards. Construction at the airfield began in 1900, and the secure military facility is the world's longest continuously-operated airfield. When war was declared in 1914, Netheravon was one of the main training bases where new pilots learned how to fly and became the number 1 Flying Training School and home to a bomber squadron. When the Second World War broke out, the increased need for pilots kept the Flying Training School busy. Netheravon was at the forefront of radical change in aerial warfare when in 1942 the advance party of the Glider Exercise Squadron arrived. 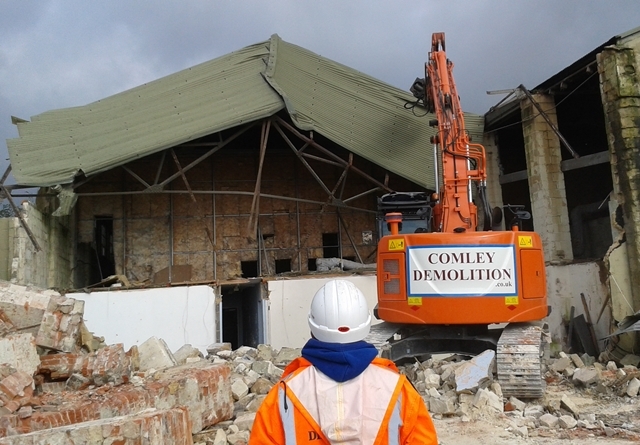 Comley Demolition were contracted to execute the complex demolition of the redundant Hadley Page Hanger, and dealt with and overcame a host of challenges including adverse weather conditions, high winds, badgers, bats and asbestos. 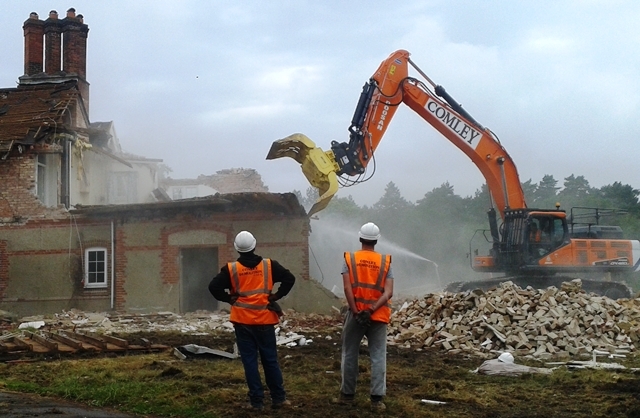 Comley Demolition received praise from our client for our professional and effective methods at a challenging site. Well done to Demolition Manager, Michael Wells, Supervisor, Sarah Watts and all of the Comely Demolition staff involved in the project. The Comley Group Managing Director, Toby Comley, has demonstrated his experience and expertise in the demolition and asbestos removal industries with his recent appointment as Fellow to the ARMI (Asbestos Removal Management Institute). 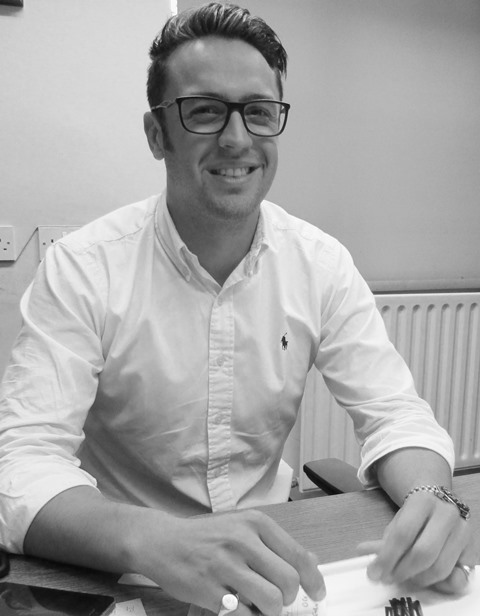 Toby achieved the ARCA level 4 Certificate in Asbestos Removal for Contracts Managers in May 2013 and the Level 6 NVQ in construction site management in August 2014 to ensure his competency and understanding in the key principles that the H&SE detailed at their recent Leadership and management seminars, ensuring his appointment. 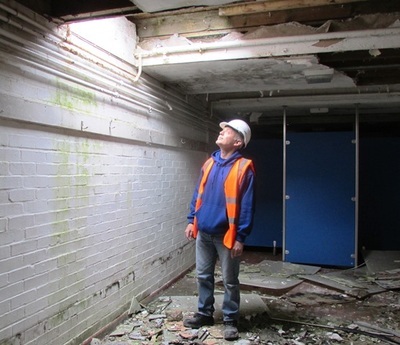 Whilst ARMI is currently a fledgling institute, Toby is keen to see it become an established industry institute, similar to the IDE (Institute of Demolition Engineers), offering professionals to chance to discuss and collaborate on approaches and attitudes towards asbestos management in the UK. The Comley Demolition team are working at a London based hotel as part of a project to replace old green houses with a state of the art gym. The hotel on the banks of the River Thames plays host to the England Rugby 7's team who will use the gym for their future training. Our managing director, Toby Comley, is honoured to have been asked to stand for election to the Institute of Demolition Engineers' (IDE) Council of Management. 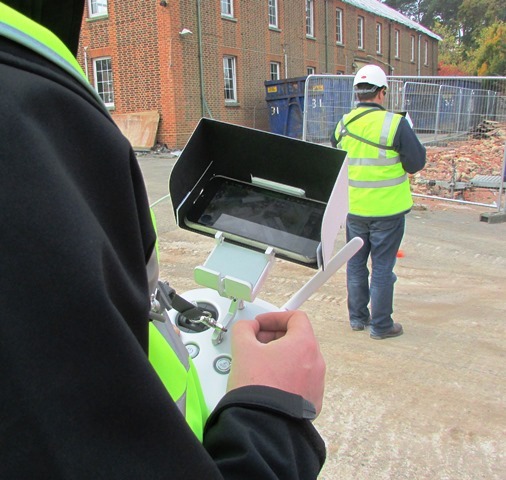 Toby said: "﻿﻿Although young in years and comparatively new to the Institute, I am passionate about the Industry which I have been involved in all my life – a third generation professional having been taught well – the Industry and associated Industries will have to adapt in the future as environments and the type of structures requiring demolition change." I joined the Institute as a Student member In January 2007 whilst studying at Northampton University where I gained a 2:1 BSc (Honours) in Waste Management Pollution Control." During my time at University I won a scholarship from the NFDC which encouraged further education within the Industry and also won the IDE Claude J Brown Best Paper submitted based on the principle of Site Waste Management Plans, this was followed by becoming a Full Member in 2012." I joined Jeto Limited, part of the Comley Group specialising in Asbestos removal after University and successfully renewed its Licence in 2011 and again in 2014 with the HSE." 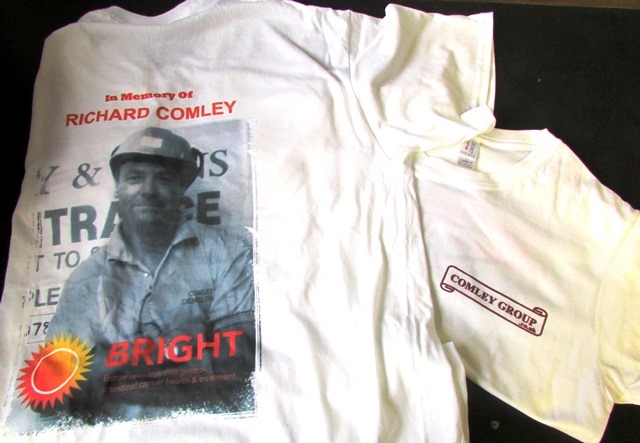 Following the premature death of my father Richard Comley, I became Managing Director of the Comley Group." I have achieved further qualifications culminating in NVQ Level 6 Construction Management and I have applied for ARMI. I am also a co-author for NNLW Asbestos Guidance Notes for the NFDC." I would be honoured to be selected to sit on the Council of Management with a promise to listen to all members and promote the Institute to a wider audience to enjoy growth and gain collective knowledge." JETO LIMITED LICENCE RENEWAL SUCCESS. 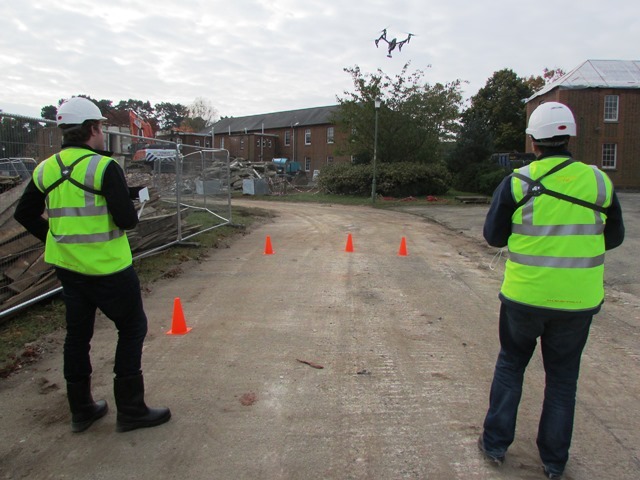 The Jeto management met with inspectors of Health and Safety at the end of June at our offices in Odiham, Hampshire. 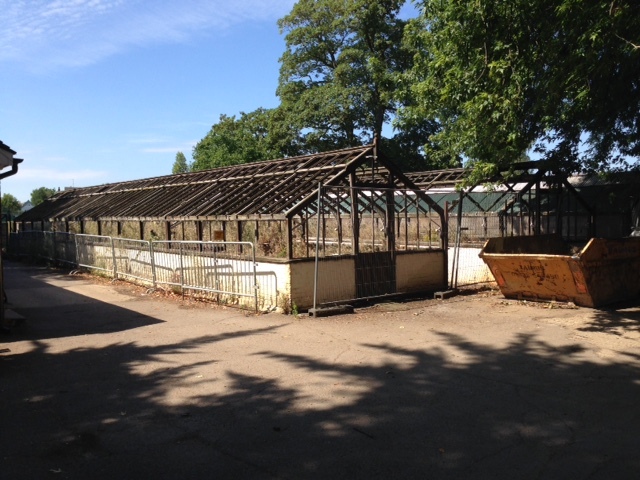 The meeting reviewed our application to renew our licence to undertake work with Asbestos. 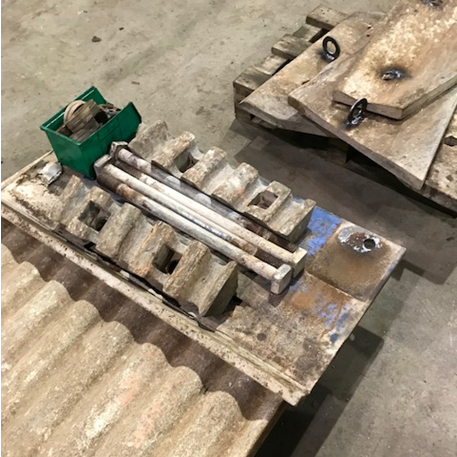 After demonstrating Jeto’s effective safe working practices and commitment towards Health and Safety, it was concluded that we were successfully demonstrating all the necessary practices and requirements to work with Asbestos and a new two year licence was granted. Congratulations to the Jeto Limited team for another successful HSE licence renewal. 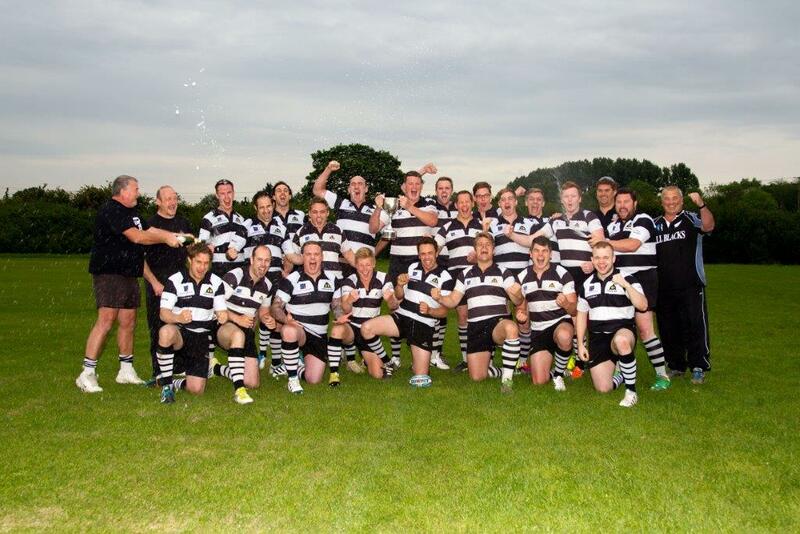 CONGRATULATIONS TO FARNHAM RUGBY CLUB! 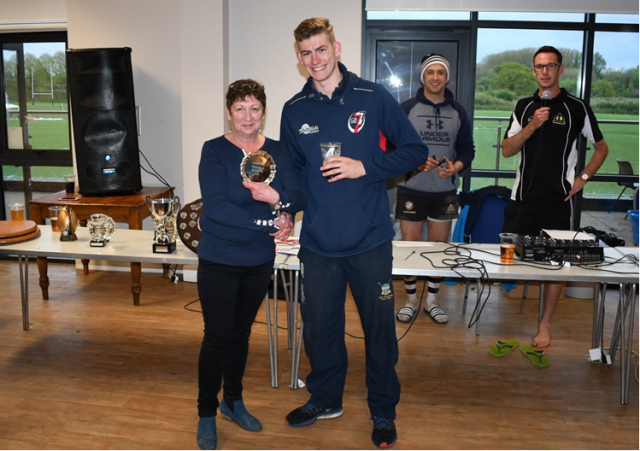 The Comley Group would like to congratulate the Farnham 1st XV for not only topping their league at the end of this season, but achieving promotion to the London 2 South West, their third promotion in as many years. The celebrations have been topped off with the squad being voted 'Team of the Year 2014' by Rugby World Magazine, with Farnham captain and Comley Group Managing Director Toby Comley leading both the team and The Comley Group into a successful 2014. Toby will continue for his 4th successive year as captain of the squad next season. The Comley Group are proud sponsors of the team and wish them all the best for the start of the 2015 season. Well done lads! ON-ROAD SKIP HIRE NOW AVAILABLE FROM COMLEY SKIPS. 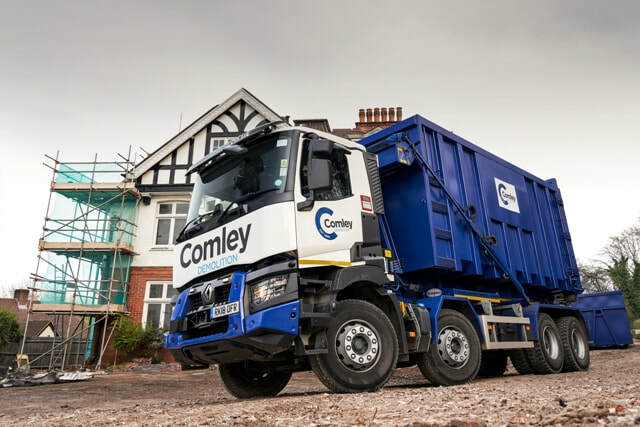 The Comley Group are pleased to announce that from May 2014 Comley Skips will be able to place skips on public highways in Hampshire. 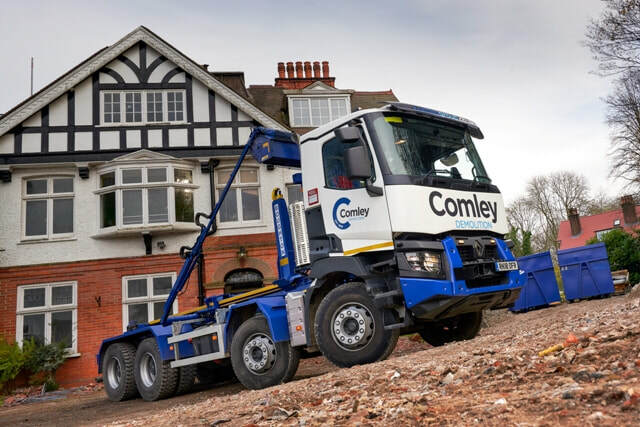 This addition to the Comley Skips range of products follows a hugely successful winter for the team and a growing demand for on-road skips from customers, a demand which Comley Skips are now happy to meet. 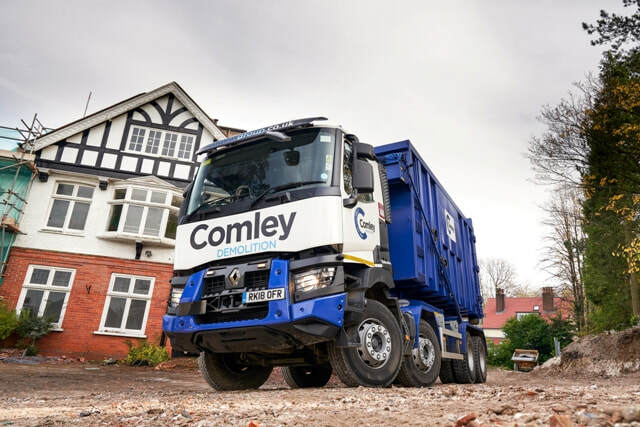 Beginning in Hampshire only, on-road skips will require a permit and as an approved skip provider in the county, Comley Skips are therefore able to apply for permits on behalf of our customers. Please allow a full 5 working days from date of booking your skip to the date the skip is required to allow for successful permit application. Additional charges will apply to on road skips. 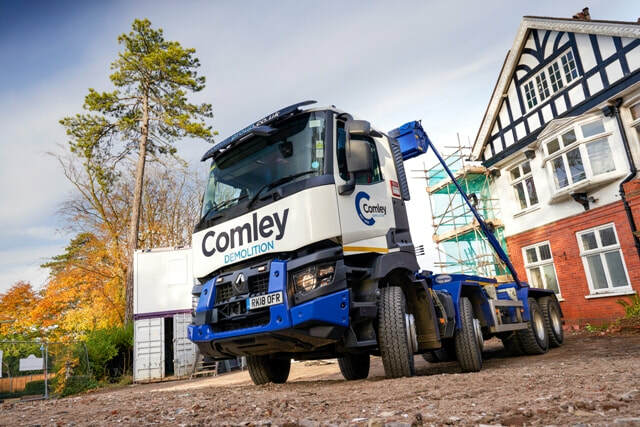 Comley Skips will continue to only be placed on private driveways in Surrey and Berkshire and therefore do not need a permit. Please specify any particular placement requirements when ordering your skip. 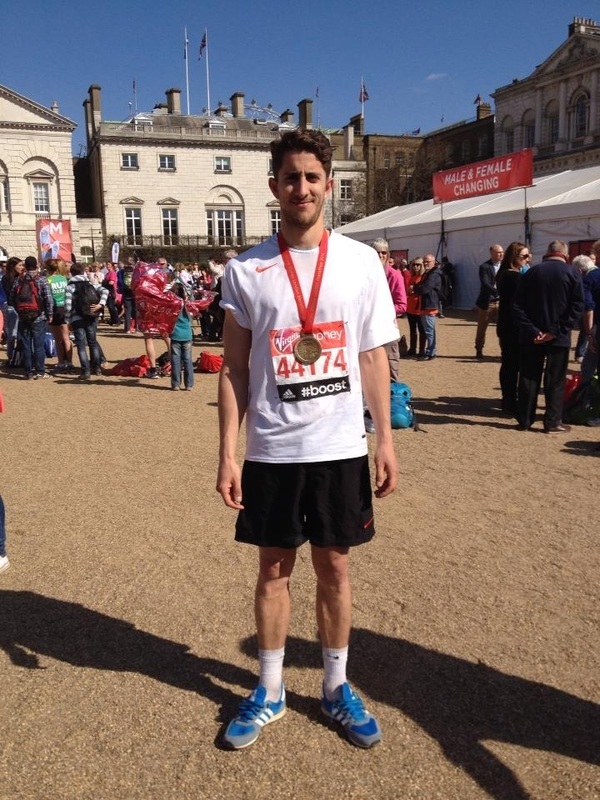 A big congratulations to Comley Demolition supervisor Mark Watkins Jnr after completing the London Marathon in 4 hours 34 minutes on Sunday, 13th April 2014. He ran on behalf of the NFDC's charities, so please send any sponsorship money directly to the Federation, quoting Mark Watkins. He follows in the footsteps of Richard Comley, who ran the London Marathon on behalf of the NFDC charities in 1999 and Toby Comley, who ran in 2012. 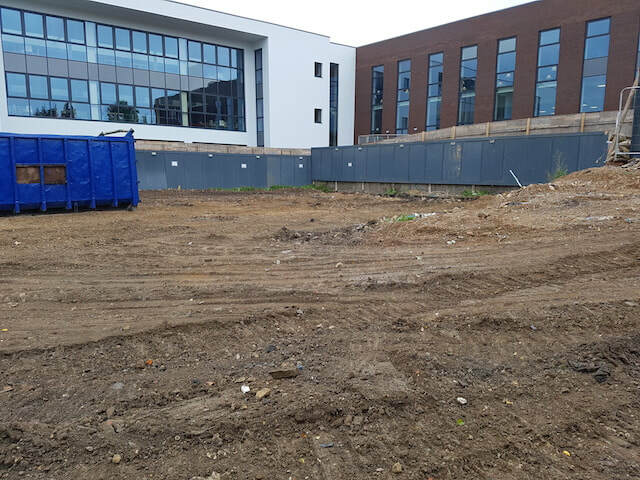 Hampshire based demolition engineers, Comley Demolition are celebrating the successful completion of a complicated city centre based project in Southampton this week, the remodelling of the city’s large Primark store. The project has taken 8 months to complete, complicated by the fact that all of the work has been carried out after dark in five phases of 10 – 15 nights over a total of four floors, with teams of between 3 and 10 staff working through the night. The team on site faced other restrictions during the project, hours were restricted to starting after 8pm and any roll on roll off bins had to be removed from site by 5.45am daily in readiness for Primark deliveries as the store remained open throughout. Over 350 tonnes of arisings have been produced from this site and Comley’s have achieved a 95% recycling rate. Works carried out by Comley’s included a strip out of ceilings, wall panelling M&E, non-loadbearing stud walls, chaining rooms, shop fronts and shop windows in preparation for the stores ongoing refurbishment. 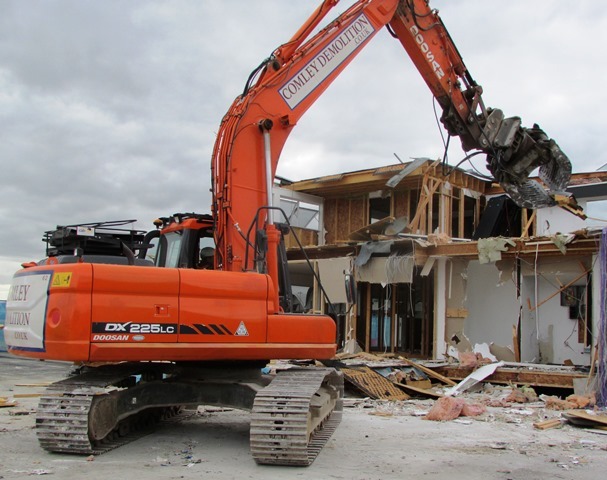 Comley Demolition increased their fleet this week with the addition of two new Hitachi 225 reduced tail swing excavators. 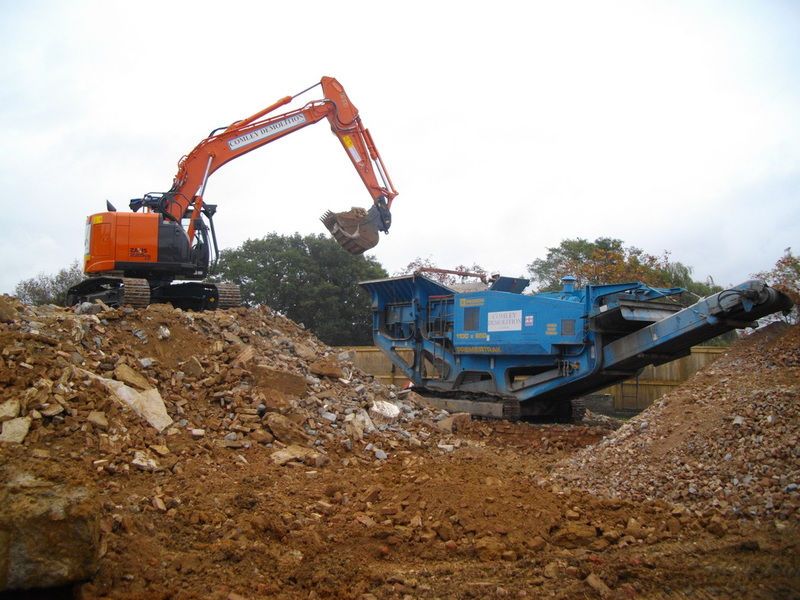 The machines have immediately been put to task at one of Comley’s sites in St Albans, producing secondary aggregate from demolition arisings. 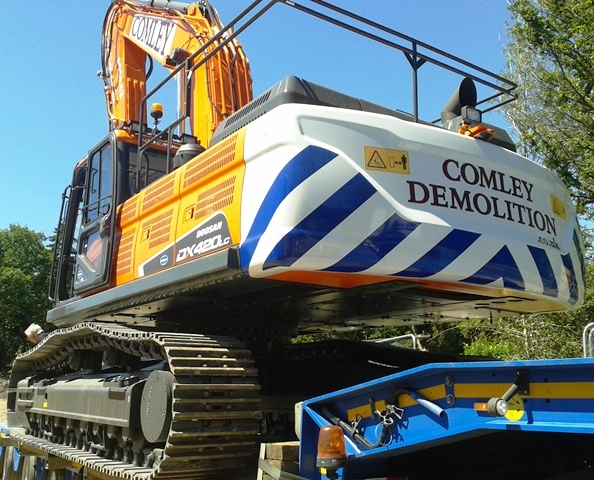 These new additions to the Comley fleet will assist in meeting the on-going high demand for their demolition services across the South. 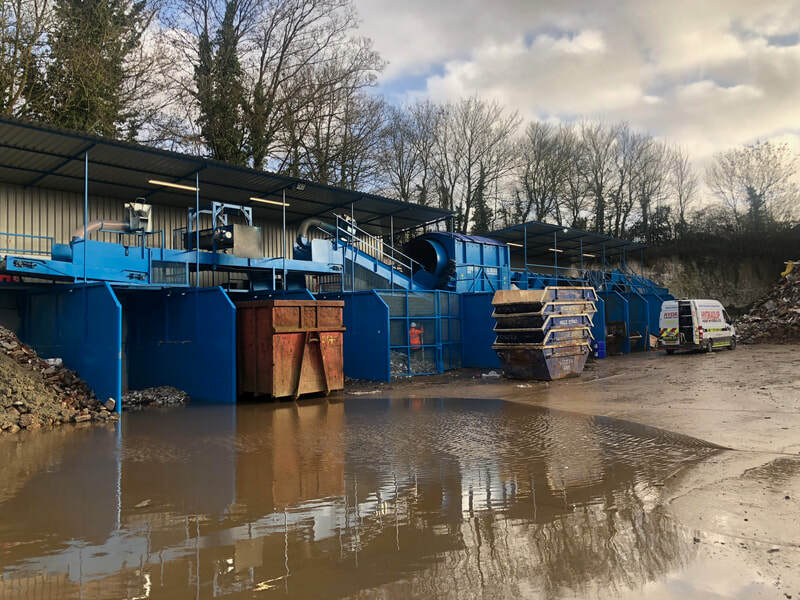 Comley Skips, operating out of Calf Lane Quarry Waste Transfer Station, have now added 4 Yard skips to their services, alongside the 6 yard, 8 yard open and 8 yard enclosed skips they already provided. Walsh (from BBC TVs ‘Ground Force’). Comley Demolition received an awards for being shortlisted for the Demolition Training Award; this is for the company that has shown full commitment towards the training and qualifying of their workforce. 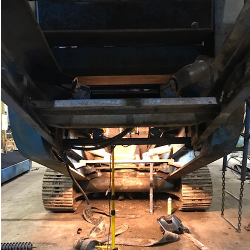 We have a full CSCS/CCDO/CPCS qualified workforce on all our sites and in the past year the majority of our Plant Operatives have gained their Plant NVQs obtaining their Competent Plant Cards, as well as many of our operatives obtaining or refreshing their PASMA, IPAF, WAMITAB, Asbestos Awareness and High-Reach Plant and Crusher Plant Cards. 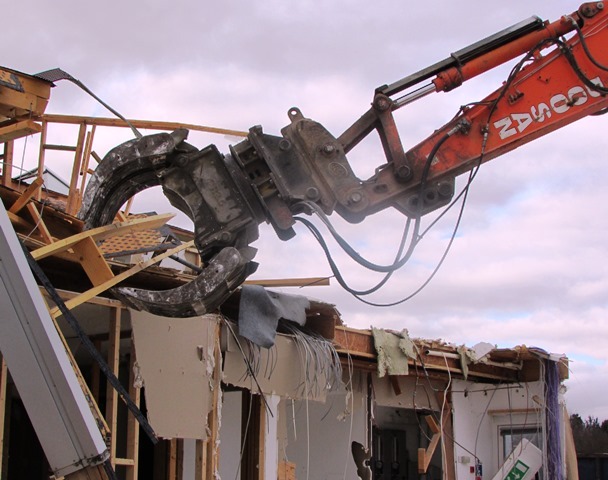 who has demonstrated outstanding progress in achieving demolition operative skills. Celebrating in style - congratulations Ryan! Managing Director, Richard Comley with Ryan Oakley and Julia Comley at the NFDC Demolition Awards in March. Ryan Oakley mixing with celebs at the awards ceremony. 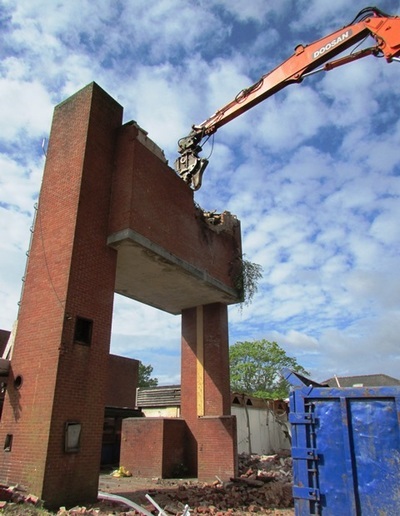 Comley Demolition has been shortlisted for the NFDC Demolition Training Award 2013. Being shortlisted for this award showcases our commitment to our employees to maintain their qualifications and develop their skills, ensuring that our clients receive the professional service they expect from us. Comley Skips are now able to offer 8 yard enclosed and open skips for hire. 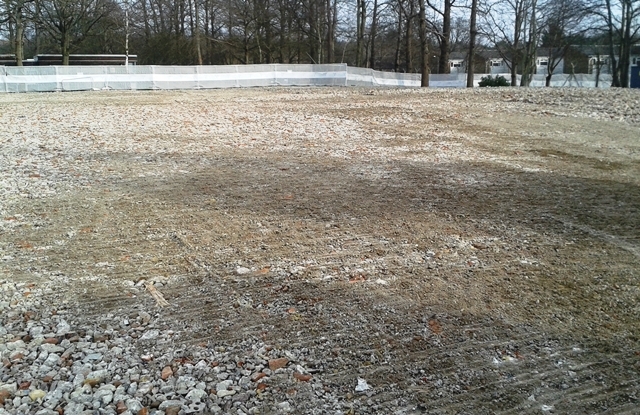 For more information refer to our website www.comleyskips.co.uk for more details and phone for a quote. 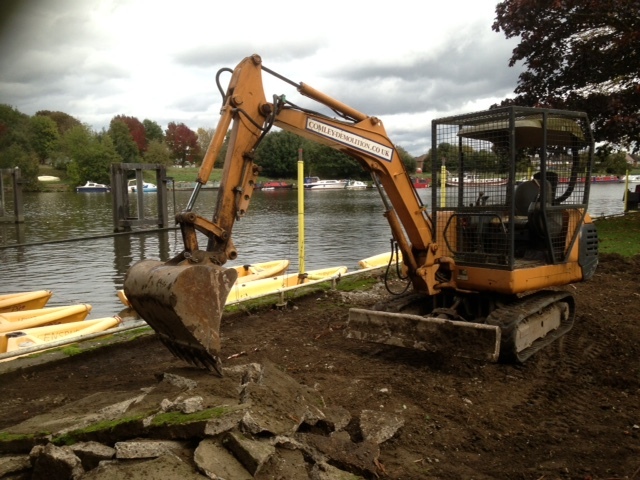 We recently undertook the demolition and removal of the BBC Analogue Transmission dish in Berkshire. This project proves Comley Demolition's ability to adapt and kept pace with the vast changes in our increasingly modern world, showing there is no job that we cannot tackle! 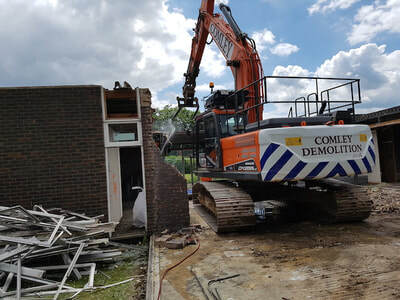 As this summer drew to a close, Comley Demolition were called upon to lend a hand at the Olympic Park with the demolition of the temporary EDF building and Coke Beat Box. 98% of the materials from this project were successfully reused or recycled.